There are several ways to classify types of tomatoes. To begin with there are hundreds of tomato varieties. Luckily, you have a lot more choices than commercial growers. Their priorities aren't the same as the home gardener's. They choose varieties with firm skins and good shipping qualities. But these don't have to be tops on your list of desirable attributes! Instead, when deciding what types of tomatoes to grow in your garden, you'll be more interested in size, color, disease resistance, days to maturity, and resistance to cracking. Oh, and taste, of course! 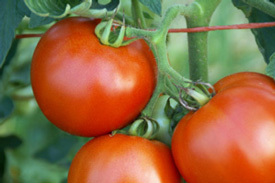 It's easiest to think about types of tomatoes by using three classifications - seed type, vine type, and fruit type. Tomato seeds are either heirloom or hybrid. Heirloom tomatoes are open-pollinated varieties passed down over generations whose seeds can be saved for the next season. Hybrid varieties are created by crossing two separate varieties to achieve more desirable characteristics like better disease resistance, resistance to cracking, or better flavor. But seeds harvested from hybrids produce fruit which may differ from the parent fruit. Hybrid seeds are therefore not usually saved. Tomato vines are classified as either stout-stemmed bushy determinate vines, or indeterminate vines with stems that continue growing until frost ends the season. Determinate varieties are the more compact "bushy" type of tomato plant that usually don't require staking. They typically stop growing at a height of three feet. Unlike the indeterminate varieties the fruit ripens over a limited period (2 to 4 weeks) which might be convenient if you want your tomatoes to ripen all at once for canning. They are more easily handled in a container since they are smaller plants. Indeterminate tomato varieties are the vining types that continue to grow taller (up to 10 feet or more) and produce fruit until frost kills the plant. They require staking or caging for support to avoid having their vines sprawl on the ground which can be a concern for those with small gardens. Another way to classify tomatoes is by the shape of the fruit. These days the globe tomato is the norm; they are the ones you'll find at the grocery store. They are smooth, round, and medium to large in size. Many colors of globe tomatoes are available. 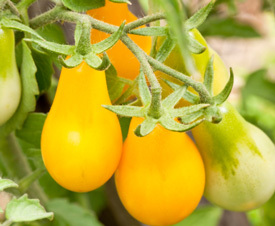 Examples of globe tomatoes include Celebrity, Yellow Taxi, and Black Prince. These are small, round, two-celled tomatoes that also include the type known as currants. They range in size from one to two inches in diameter. Cherry tomatoes come in many colors. 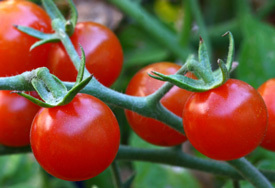 Sun Gold, Honeybunch, Italian Ice, Sweet100, and Jolly are examples of cherry tomatoes. These are large to very large tomatoes that are typically wider than they are tall, as opposed to round. The larger specimens tend to be even flatter. They can be irregular in shape compared to the other tomato types. 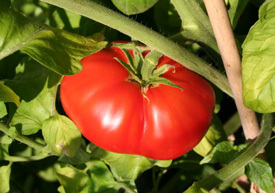 Brandywine and Black Krim are beefsteak tomatoes. Elongated tomatoes that are generally smooth. The pear shape like that of the yellow pear is distinctly smaller near the stem. The plum is more uniformly elongated than the pear shape. Roma tomatoes are plum tomatoes.